ACCEPT OUR INVITATION. Relax and enjoy yourself on the finest sugar sand beach on the Emerald Coast. 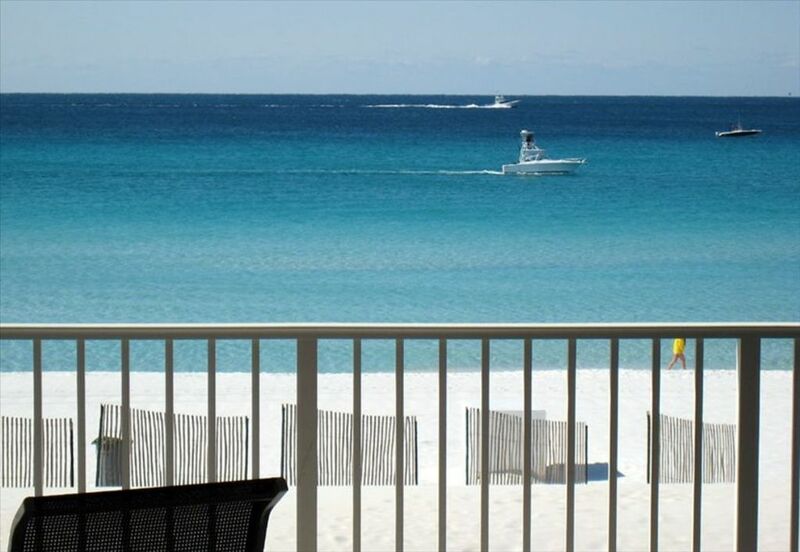 Our unit is located on Okaloosa Island, in the ISLAND PRINCESS, and offers the finest in Gulf Coast accommodations. Our unit is located on the third floor directly on the beach. The view of the beach and the water is unobstructed. You will enjoy the view and sound of the ocean from the master bedroom and living area. Unit 300 is a quiet end unit, with a private, gated-entrance portico, perfect for families with young children. The unit has three bedrooms, each with its own private full bath, and its own cable TV. The unit contains a king-size, queen-size, and two twin beds. Pull out the queen-size sofa bed and the unit will sleep eight in comfort. You choose your activity level. Being on Okaloosa Island we are out of the main flow of the traffic and the beaches are not crowded; yet, we are within minutes of practically any activity you could desire for yourself, the family, or the kids. If you want to relax, grab a book and pull up a spot on the beach or the balcony. If you want things to do, consider: the finest deep-sea fishing in the world; some of the best golf courses in the Southeast; the shops and outlets of Destin, Sandestin, and Fort Walton; the Gulfarium; the best of kids' activities; dancing at the local night spots; and if you love to eat, be it seafood, steaks, Italian, Continental, we have a number of excellent restaurants within two miles. We enjoy making recommendations and hearing your comments. If you don't want to drive, we are approximately ten miles from the Fort Walton Beach Airport; fly down and rent a car. Accept our invitation. You will not be disappointed. Listen to the sounds of the waves and step out onto the beach. Just about as close as you can get. If you like you can just sit on the balcony and listen to the waves and watch the other people suntan while you enjoy a drink and a good book and keep the sand out of your shorts. Full and complete kitchen with up to date appliances and fully stocked cabinets of glassware, dishes and cooking utensils. Table sits six, plus three additional at counter. Many books to read and enjoy. Take one, leave one. Beach Service Set-up Included, Exercise Room, large selection of books and videos, Several excellent restaurants within one mile.